How do I manage my segments? 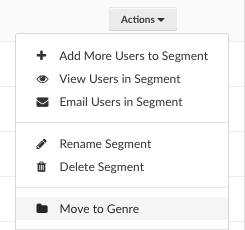 View all your segments by clicking Segments in the left sidebar. 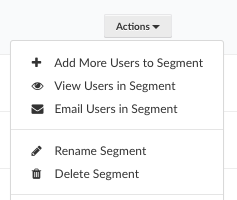 Hover over a Static Segment and click Actions to add users to the segment, view users, email users, rename the segment or delete it. 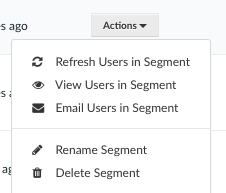 Hover over a Live Segment and click Actions to refresh it, view users, email users, rename the segment or delete it. 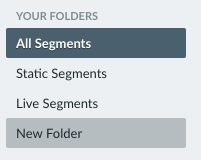 Once you've created a folder, you can move segments into it using the Actions dropdown. See What are segments? for more details.